Canada’s demographics are changing and Nova Scotia shows no exception. Right now, one of the main challenges is overcoming major gaps within the labour market, because there are more people leaving than entering the workforce. The Cape Breton Partnership invites you to attend an information session for employers to understand the changing labour market needs in Cape Breton, the new initiatives being put forward by the provincial and federal government, and a current list of solutions available for your workplace. Looking to address the emerging labour market challenges. 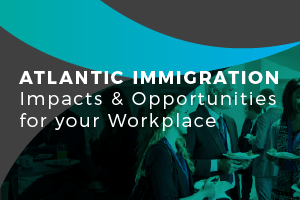 As a Hiring Manager or an HR Professional, this is your chance to engage with the Nova Scotia Office of Immigration and their regional partners on the benefits of immigration and which programs you can utilize to get started. Meet with the Nova Scotia Office of Immigration, the Cape Breton Partnership, Immigration francophone de la Nouvelle-Écosse, YMCA – YReach Settlement Staff, New Dawn – Cape Breton Island Centre for Immigration and Immigrant Services Association of Nova Scotia. This event is free to attend, but pre-registration is required. Click here to register.